So, I was thinking that Vicki was right yesterday, when she suggested having happy magnets this month. We'll see how long this Happy Magnets month lasts. Heh. I might not make it past this post. 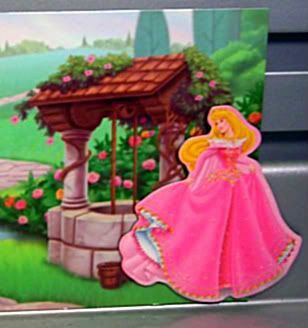 I picked up this Princess Aurora/Sleeping Beauty magnet - and the other Disney Princesses - as a set from the $1 aisle at Target. Hello, jackpot! I'm only sorry I didn't pick up the Cars set, too! No worries, I'm sparing you a full Disney Princesses week...or rather, I'll be using them sparingly this month. Hahahaha. Anyway, here's my happy (or, actually more grateful), thought of the day. Every once in a while, I hear or read something that just makes me damned happy that my parents came to America and had me. All politics aside, you can't deny that we're damned lucky that we don't have a government that's censoring our communications. Case in point. Today, I read this Britannica blogpost and I learned that my friend at Your Nose Is Quite Big living in China has had her access to all things social networking blocked. She can't Tweet. She can't YouTube. She can't blog on Blogger or Wordpress. She can't upload images to flickr. Dudes. She can't even use Hotmail! Apparently, they've banned the entire nation (!!!!) from these social networks to help curb any talk about tomorrow's 20th anniversary of Tiananmen Square. Well, I guess they don't call it the Great Firewall of China for nothing. Still, how frustrating! And how much does it make you appreciate the (mostly) free reign we have here to speak our minds? Ah, China. Napoleon once called you the sleeping giant, saying something like "Let her sleep, for when she wakes, she will shake the world." Huh. Uhhh, good morning, I guess. It's amazing in this day and age that citizens of any country will stand for that kind of censorship. Sad. Wait, this was supposed to be happy month! I was always a Cinderella girl myself. Did they have Finding Nemo magnets? I imagine that those would be fantabulous! Hee. No, no Finding Nemo. All they had were the Princesses and Cars...and then I've never seen those magnet sets again at the dollar aisle. And you know I look!